Dine. Dance. Cruise. 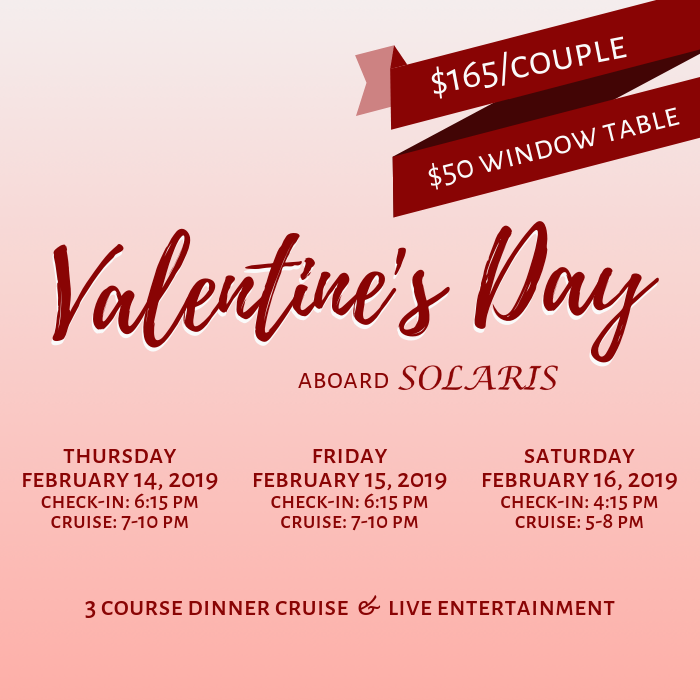 Celebrate Valentine’s Day aboard the SOLARIS! The Dining & Dancing Cruise is located within the Sandestin Golf & Beach Resort. SunQuest Cruises is hosting three Valentine’s cruises with a specialty three course menu. Enjoy live entertainment as you cruise through the Choctawhatchee Bay. Executive Chef, Josh Champion, has created a special menu starting with a Smoked Tomato-Artichoke Bisque, before moving on to your choice between Filet de Madeira, Trout Meuniere, Apricot-Fig Glazed Chicken, or our Vegetable Harvest. Finish your evening with our Red Velvet Cake, perfectly baked and topped with cream cheese icing. Reserve online at SunQuestCruises.com or call 850-650-2519. A 72 hour cancellation policy applies to all specialty cruises. $165 per couple ($82.50 per guest) includes a three hour cruise, three course meal, live entertainment, and iced tea, coffee, and water. There is a full bar on the boat to purchase additional drinks from. Call 850-650-2519 or email Info@SunQuestCruises.com for more information.